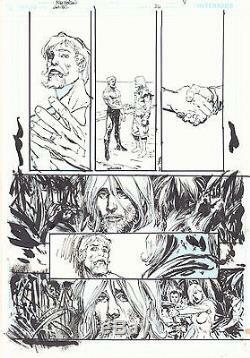 Green Arrow / Black Canary #26 p. 8 - 2010 blue ink art only by Bill Sienkiewicz. Size: 11" x 17" - Blue line of Mike Norton layouts. This item was uploaded by Bobby. If there are any problems with your order whatsoever, please message us before leaving feedback and we'll be happy to work with you to fix the situation! The price may vary based on size, weight, and location. The image pictured is original art unless otherwise described. Same goes for CGCs, as the package gets bigger and heavier as you go. Ive had some bad experiences. You neednt worry; we are professionals who value your business and want your item to arrive safely as much as you do. This is normal for our Post Office and will not impact you receiving your item in a timely matter. Have these CGCs had any previous owners? I see the word STAT when describing the art page Im interested in. A STAT is essentially a photocopy glued on to one or more of the panels by the artist done during production of the piece and is not original artwork. We will do our best to clearly identify whats a STAT or what isn't on your page, if indeed it contains one. At Anthony's Comic Book Art we're caffeinated to give you excellent customer service! Pictured left to right: Nicole, Connelly, Bobby, Anthony, Shannon, Amanda, and Chris. This # is text enabled as well. The item "Green Arrow / Black Canary #26 p.
8 2010 ink art only by Bill Sienkiewicz" is in sale since Thursday, December 01, 2016. This item is in the category "Collectibles\Comics\Original Comic Art\Interior Pages". The seller is "anthonyscomicbookart-online" and is located in Leonia, New Jersey.